If you ask the mandarin learners what is the most difficult part of learning mandarin Chinese? The majority of them will tell you it is the pronunciation. Actually, the elementary difference between Mandarin language and western languages is that mandarin is a tonal language and its mastery is essential. Moreover the tone determines the meaning of the word or syllable. Mispronounced tones can make your spoken mandarin difficult or even impossible to understand, that’s the reason why so many mandarin learners found it hard to follow other people’s talking as well as made themselves understood. Tones in English are using for inflection, which is a completely different usage from Mandarin. Rising tones in English often imply a question or sarcasm. Falling tones may be used for emphasis. Changing the tones of a Mandarin sentence, though, could completely change the meaning. Feeling frustrated already? The good news is we do have some shortcuts. 1. Find a native speaker from China to help you with tones! Better be a professional one. There are four main tones. Let’s take the vowel “a” for example: ā, á, ǎ, à. (flat, rising, falling/rising, falling). Just like the learning process of English, you should also learn to hear the differences and practice the pronunciation of Mandarin sounds. B: Awesome! I highly recommend it to you! So the first tone of mandarin sounds just like the same when you say “awe” from the word “awesome” in a higher pitch. 3. The second tone is very similar to the tone when you use the English word “What?” to ask a question. It rises from the middle of the voice. In pinyin, second tone is written like á, and it is often called rising tone. 4. The third tone starts in the middle and it goes down quickly, and then rises up, so it is called falling-rising tone. It is not the same as a second tone because it starts lower, falls down a little, and then goes up again back to the middle sound. The closest sound in English is “huh?” when said in disgust. In pinyin, third tone is written as ǎ.
Additionally, there is a fifth or “neutral” tone. Usually we can find the neutral tones with some onomatopoetic words and the second syllables in some words. How these words are pronounced depends on the tone of the previous syllable, but the neutral tone is always short and light, about half the length of a full syllable and the pitch is lower. 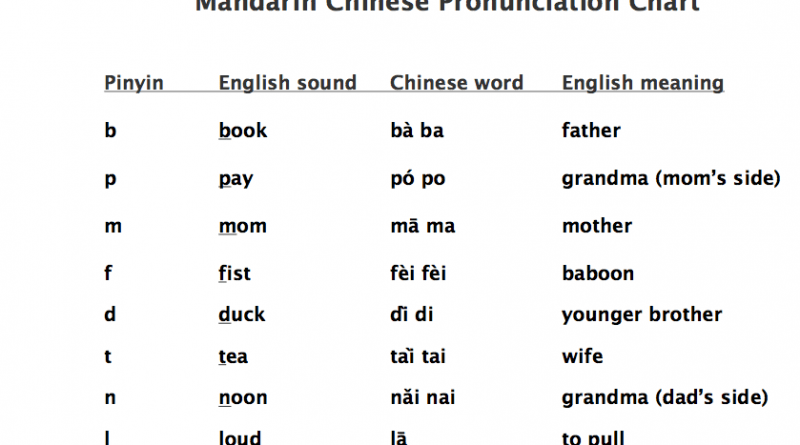 This is a chart of mandarin pronunciation guide with an English word as example of each. You can take them as a reference and practice with them for they provide the concept of how to pronounce Mandarin accustomed to the English pronunciation. The sounds are given in Latin alphabet, but please be careful that some of the words do not represent one hundred percent correctly the exact pronunciation of Mandarin pinyin; so the easiest and most secure way to grasp it is to find a mandarin teacher of yours!